The fact that solar has become quite mainstream can be gauged by the fact that the industry is witnessing widespread protests with regards to taxes and charges levied on solar. After the infamous debate around safeguard duty imposition, the latest row is about the rate of Goods & Service Tax (GST) on solar projects. According to the prevailing norms, a solar project is subject to 18% GST while solar panels qualify for 5%. Read all about GST on renewable energy in India. The uncertainty around safeguard duties has alerted solar producers already. Prior to GST, the net tax effect on the solar power industry was less than 5%. An 18% GST would be too high for solar producers as it would become an additional cost for them. The AAR (appellate authority for advance ruling) on the other hand, has regarded the installation of solar projects as work contracts as they comprise a supply of goods and services packaged into an immobile property. “A general consensus among various GST advance ruling authorities of 18% rate of GST on solar power projects is an aspect of worry for solar industry players who believe that a 5% tax should be applicable,” said Abhishek Jain, tax partner, EY India. Any new ruling in the solar industry becomes a major discussion point before becoming effective. While the government at the center is a big supporter of clean renewable energy, the policies have to be formulated in a way to cause minimum chaos in the industry. India which has humongous solar installation plans by 2022, needs such policies, to retain peace and calm in the industry and grant it the required impetus to move forward. 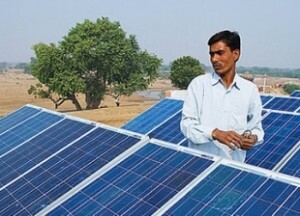 Given its huge potential, Solar has already become a highly competitive industry in India. Now, these extra charges will further affect the bottom lines for the solar manufacturers. It is to be seen whether the Sun (read Solar) will shine in India through the clouds of duties and GST, in future? For more such updates subscribe to our blog by clicking here.